Klipfolio is an online dashboard platform that allows you to easily build real-time dashboards. It is very easy to compare your actual results with your targets so you can take action quicker. The tool seperates itself from it's competitors by its low price, ease of use, flexibility in data connections and its api. Klipfolio is by far the best dashboard tool for marketing, sales, accounting and IT dashboards, to keep track of the health of your organisation. The Klipfolio roadmap is aiming for two things: The expansion of the data connections from new platforms and the further improving of the ease of building graphs and tables. The ease of use is very high on the priority list of Klipfolio. As one of the leading Klipfolio in Europe, Cervino Marketing is one of the first to get access to beta's of new features and the latest news. We try to share this news as fast as possible with our clients through our blog posts (see below). Klipfolio is about to release a few major updates. Some improvements are still in beta, others are coming soon (or are already available). Metrics Klips, an easier way to create graphs without using formulas (in beta) - see the press release here. 2. Roles & Groups: It is very easy to show or hide graphs or tables for particular user groups. This way the team only sees what it needs to see. 3. Data connections: Klipfolio offers a wide range of ways to connect data to use in a table or graph. From simple manual uploads to connections to Dropbox, Google Drive or BOX, to direct connections with Google Big Query or SQL databases. This allows you to combine different kinds of data from multiple sources in one place. Our service Cervinodata also has a direct integration with Klipfolio. 4. Formula editor: Through the formula editor calculations can be made to show in the dashboard. From simple totals and averages to more complex moving averages and standard deviation. 5. API & SSO: Klipfolio can not only be managed through a user interface but also through its api. Using the Klipfolio api, all kinds of repetitive manual tasks can be automated. Think about deploying multiple dashboards to different clients, setting roles and rights for many users at once etcetera. This makes Klipfolio a very scalable platform for more advanced users or organisations. For organisations or any size it usually is quite had to maintain enough capacity to manage and improve the (Klipfolio) dashboards. In that case it might be interesting to work with a specialised partner to service the daily business for Klipfolio. Klipfolio's api allows you to deliver and maintain dashboards at scale. 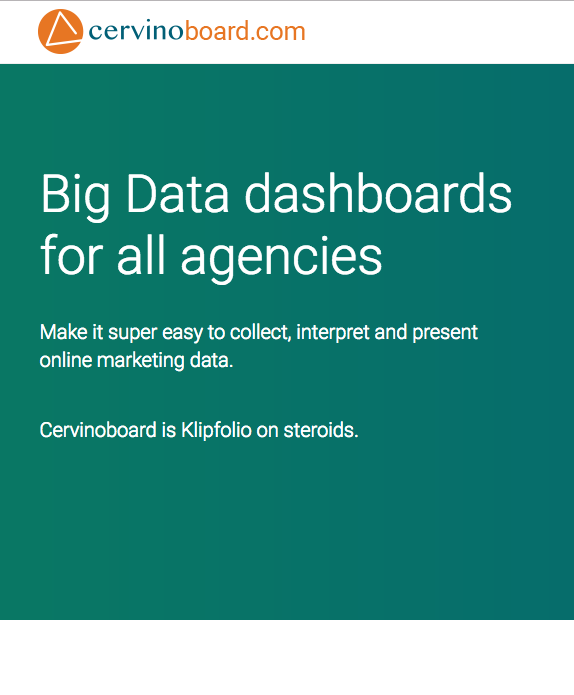 Since the beginning of it's availability, Cervino Marketing connected to Klipfolio's api and built an advanced application to create, deliver, update dashboards and keep data up-to-date. A lot of time can be saved keeping all your dashboards nice and tidy. Agencies in particular struggle with this challenge. 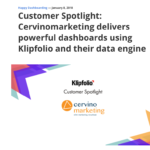 Check out the Customer spotlight blog, to see how Klipfolio and Cervino Marketing work together. Through our product Cervinoboard we make it easy to use Klipfolio at scale. We can maintain all the dashboards for all your clients. This will save you valuable time. Time you can use to impress your clients with better service. No hasstle with data storage and deliver. We will take of this. Better insights by having all your clients data in one overview. Outsmart your competition? Use our benchmarking service to easily compare clients.